I've lived in Switzerland on and off now for more than a decade. During that time, I've slowly seen more Asian grocery stores open, and more Asian ingredients become available. As far as I'm concerned, that's a great thing. When I saw some fresh lotus roots at my favorite Chinese grocery store in Zürich, I did a little dance of joy. I could only find it frozen or canned before. Lotus root, known as renkon (蓮根）in Japan, is an interesting vegetable, that changes its nature by how much you cook it. When it's raw it's rather bitter; when cooked briefly it has a very unique, crunchy texture; when stewed for some time, it turns starchy. It's packed with fiber and various nutrients, and even used for medicinal purposes in the past. (Wikipedia entry). The outer brown skin is peeled off (a vegetable peeler works great for this task). 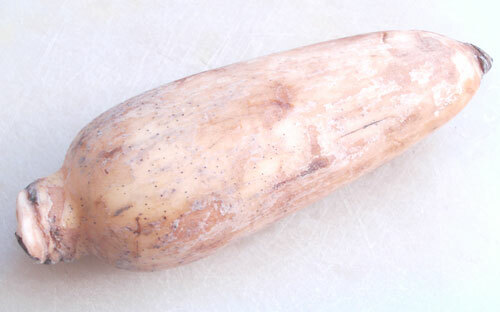 Sliced lotus root can be boiled or blanched, steamed, stewed, deep-fried and so on. The lacy pattern adds instant flair to your dish. Here though I grated the raw lotus root to make little pancakes out of them. When lotus root is treated like this, the texture turns quite starchy and dumpling-like, a little like rice cakes (mochi). Generous amounts of chopped fresh coriander leaves and green onion are added, for a pan-Asian flavor. They are gluten-free, vegan, and generally quite healthy, but they taste great too. Because they are rather dense and starchy, it's best to make them quite small, about the size of a poker chip. 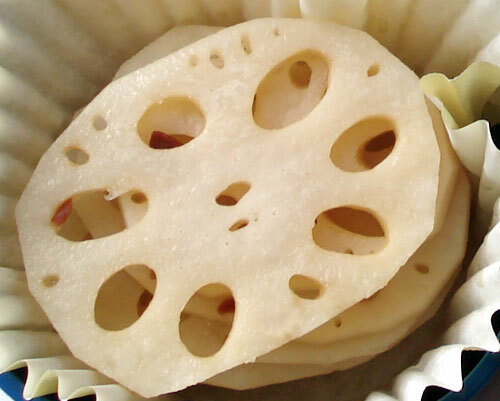 Peel the lotus root and grate on a fine grater. Drain lightly in a fine-mesh sieve to get rid of excess moisture, but do not squeeze. Add salt. Add enough potato or corn starch (use a gluten-free version if you are sensitive) to just hold the dough together sufficiently to form patties with. Add the chopped coriander and green onion and mix well. Heat up a non-stick frying pan or griddle. Drizzle with a little sesame seed oil. Make little cakes or patties from the dough, and put in the hot pan. You should get about 8 to 10 little patties. Leave to cook over medium-high heat, until the cakes move about a bit if you shake the pan. Turn each cake over carefully with a spatula. Drizzle in a little more sesame oil if necessary. Continue cooking, flipping over more times if necessary, until the dough changes from an opaque white to transparent pale green, and the surface is browned and crispy. Serve hot or at room temperature, with sweet chili sauce or chili jam for dipping. Great party food, or as a tasty carb component of a bento. How to cook lotus root, a basic primer. Submitted by maki on 2008-02-18 18:11. I love lotus root, and I'm looking forward to trying this sometime! :) I was just wondering though... do you think the little cakes can be frozen? They should freeze successfully I think, though so far I've not gotten a chance to (they disappear too fast). Beautiful dish! I wonder, about what are the measurements of the raw or "fresh" lotus root? As I've seen something quite similar in Montevideo, Uruguay and I would be totally happy if it were lotus root. And are there other names for lotus root? Oh, this just looks so delicious. I once (yes, I'm a starter at most things) had lotus root in a typical japanese clear soup (and of course, at the moment the name eludes me), but to me it didn't have a specific taste. It looked beautiful though, and I'm sure these cute little cakes will be a lot more tastier. By the way, I absolutely love your blog! ode, in the recipe I call for a root about 9 inches / 25 cm or so long, though they can be shorter or longer of course. You should end up with about 1 cup of grated root (220ml). The wikipedia entry linked to should have more info about alternative names. mewmew, thank you! (Lotus root is used in a lot of soups so I can't say which one it might be specifically). I have no made lotus root in a gyoza shape, but i've made it as a sort of sandwich with meat filling. You basically have to parboil the slices until they are soft, the meat mixture has to be mostly meat and not loose like a gyoza filling (it should be more solid like a shuumai filling), since it's the meat protein that helps things stick. Also using a bit of potato starch or cornstarch helps it stick too. hope that gets you on the right path! I'm definently making these. 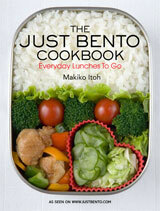 Thanks Maki for your great recipes and blogs! At the moment I'm in Japan but only have a microwave and a toaster/grill; do you think these might work if you grill them up close to the heat? I have a feeling all of your delicious mini-burger ideas (tofu and vegetable ones) really need to be in a pan to work... :( i need a stove! I guess you could try cooking it in the microwave, well covered, until cooked through (since microwaving gives similar results to steaming), and browning them in the toaster oven, with a little oil brushed on the surface. I haven't tried it but it should work theoretically. Do you think you can make this with frozen lotus root? I did not know that there is such a thing like this :) Thanks for sharing. Looking for cakes in Adelaide? Get unique, great and artistic cakes at Cakes. Special cakes are made fresh everyday! What a unique way of using lotus root! I've tasted it in Indian curries, so I'm sure these must be lovely too! It'd be great if you could send these in for the Magic Bullet snack recipe contest/giveaway hosted on my blog! Just wondering, the green onions you referred to are also called spring onions or scallions, yes? I don't usually comment on blogs, but this recipe was too good for me not to thank you for posting it! It blew my mind. 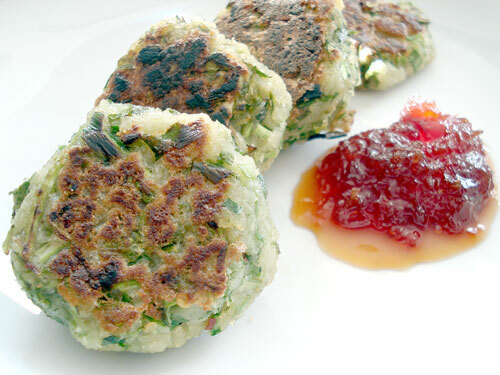 The patties stuck together very well (which I had doubts about) and it tasted just like potatoes when they were done. I'm making these again tomorrow! Thank you so much for sharing. Your recipes always turn out well when I make them. I don't know if I should take full credit here for the following, but I've never seen any recipe that uses the 'excess moisture' that is mentioned here after you grate the renkon to a pulp. Well, that moisture, renkon lovers, is an amazing nectar. I always felt it was a shame to throw it away and one day, I thought of warming it a bit, following the 'Asian' philosophy that things should be cooked. A low flame gradually yielded a quite unexpected reaction: the thin renkon juice turned into a gradually thicker creamy paste, as I stirred more and more vigourously to prevent it to stick the bottom of the pot. I removed from flame and added a pinch of freshly grated ginger and a swill of shoyu, since renkon has no taste, remember... Since then, this is the choice 'amuse' that I serve to my guests in small sake cups with a tiny spoon and invite them to guess the main ingredient. No one has ever found out the answer yet. The thickening on low flame and constantly stirred takes maybe a minute or so, so 'stick' around.